At its core engagement is about creating opportunities for dialogue but for every context, community and research area, the goals and nature of the engagement will be different. There is not just ambiguity in what we mean by community engagement, but also a range of other terms that overlap with it: Public Engagement, Public Participation, Citizen Science, Civic Involvement, Patient and Public Involvement, the list goes on. These terms are used differently by different groups so getting too bogged down in understanding the boundaries between them is not always a good use of time. Caption: Mary Chambers, Oxford University Clinical Research Unit, Vietnam, describes the spectrum of engagement using case examples from across Vietnam. Engagement has intrinsic value – it feels right, it is ethical – and instrumental value – it makes policy and practice more appropriate and improves the design and acceptability of research. Each engagement project is likely to have both intrinsic and instrumental value but the priorities of the activity may lean towards one or the other and it will have its own unique set of objectives in line with this. These objectives are as broad as engagement itself and at the outset of each activity it is crucial to set out what you believe the project’s objectives to be – even if they change – as having a standard set of objectives for engagement as a whole is unrealistic. Must Do - This is the engagement essential to doing high-quality, ethically sound, population-based research. It enables recruitment, retention, and ethical approval of the research. Engagement activities in this area may include consultation of an advisory group and tend to focus on patients, participants and those directly affected by the research itself. Smart to Do - These engagement activities are not integral to the research, but usually add value to a specific project, for example by providing training in communication to researchers or fostering debate about the health issue being investigated. Researchers often see these type of activities as being at least partially in their own interest. These “smart” activities help to facilitate trust between researchers and communities and ensure the views of the community are fed into the research methods and the development of research questions. Wise to do - This big picture engagement aims to foster a society in which science can flourish. It might include engagement in schools or training science journalists and will likely engage people not directly affected by specific research but look more broadly at society as a whole. These “wise” activities inspire, demystify and inject science into culture, developing longer term outcomes like fostering an environment in which science is understood and accepted, and where society has the tools to engage with it through improved science literacy. Wise engagement is often driven by people who do not consider themselves to be researchers but practitioners of public engagement. Caption: Image from the Health in the Backyard project in Vietnam. The methods chosen for engagement will depend on who you are trying to engage (your “communities”) and the context. 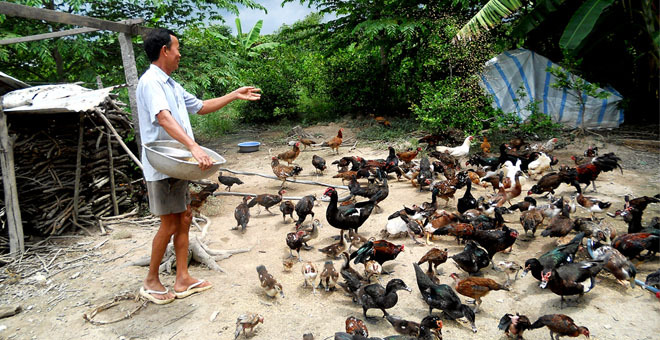 In Vietnam the contexts are diverse, the communities are varied, and the population is vast. The Oxford University Clinical Research Unit (OUCRU) in Ho Chi Min City is set within a tertiary hospital with 500 beds and a catchment area of 40 million people. As such, the community OUCRU engages with is very difficult to define by geography and its engagement work spans across many methods including science cafes, school engagement, science theatre, participatory arts, community advisory boards, photo stories and media. Hear from Du Vu Thanh, who runs the OUCRU school engagement programme, in the Wellcome Trust International Engagement Workshop panel on school engagement. Read more about the OUCRU Health in the Backyard photo stories project which used visual media as a participatory tool for storytelling and engaging a community directly affected by diseases which are transmitted between animals and humans. There is a spectrum of ways in which theatre can be used in engagement. At one end theatre audiences can watch theatre as a way to impart health information. OUCRU has three science theatre pieces that use comic and interactive theatre to engage young people and their parents with health messages that have reached around 100000 people. More participatory modes of using theatre in engagement include community theatre, where the theatre is created by or with the community, and Forum Theatre where the story and drama shift and evolve as the performance takes place. Read more about a community theatre project “Village Drama Against Malaria” developed in Thailand and now delivered in Vietnam. The content on this page forms part of the online report for the 2017 International Engagement Workshop "It's Complicated: navigating scientific complexity in public and community engagement". To read more visit the introduction to engagement theme from the workshop or access the rest of the report including video presentations, discussion summaries, and tools, on the workshop page.